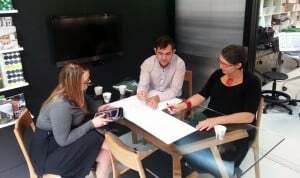 PARLOUR: a space to speak – bringing together research, informed opinion and resources; generating debate and discussion; expanding the spaces for women in Australian architecture. Meet Melinda Dodson, director and principal architect of Melinda Dodson Architects. Melinda was interviewed by Michael Smith and is the latest profile in our series of inspiring Australian women architects. 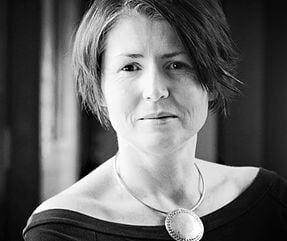 Melinda is the Principal of Melinda Dodson Architects (MDa), a design and research practice of experienced architects, landscape and urban designers undertaking commercial, mixed use, residential and education projects. She is a Past National President of the Australian Institute of Architects, and Past President of the ACT Chapter, where her primary focus was on sustainable cities and architecture advocacy. Awards include the New Experimental Architectural Typologies competition (2014), NAWIC Outstanding Achievement in Construction Award ACT (2013), University of Canberra PhD scholarship (2012), Instyle Design Award (2010), and the Australian Institute of Architects ACT Young Architect Prize (2005). Melinda believes passionately that sustainable cities and architecture holds the key to solving many of the frustrations of our cities, and these values — along with her PhD research on sustainability, house size and user satisfaction — underpin her practice. Melinda is particularly important to Parlour – she played a key role in the Institute becoming an industry partner in the Equity and Diversity research project that led to Parlour during her time as president. What do you enjoy most in the practice of architecture? I’ve always enjoyed architecture but think it takes a while to mature as an architect, to find your place and the contribution you wish to make. In the last five years (since starting my own business MDa) I have renewed my 3D modelling skills and this – in combination with 20 years of experience, and the provocations that come from my PhD research on ‘small houses’ – combine to make architecture very exciting for me. I became interested in the ‘no bigger than necessary’ design thesis some ten years ago while active with the Institute of Architects and since starting the PhD it has morphed into user-centred design – that is, using ‘social research’ techniques to delve deeper into design and the use of ‘small houses’. I also enjoy the collaboration and critique process; the pursuit of that self-evident, elegantly simple solution – not forced – but rather the solution that resolves many issues at once and usually requires a lot of work to conceive! It involves listening to clients – really listening – and sometimes they’ll say ‘keep going’ or you know yourself to keep going! It’s very satisfying when you reach that point where it’s successfully resolved. Can you tell us about a key project that you have been involved in? Recently MDa won the New Experimental Architectural Typologies (NEAT) competition, a very satisfying win as it was the result of bringing together our creative endeavour and our research, an approach that underlines what we stand for as a practice. There is a body of post-occupancy evaluation fieldwork, including our practice research, on the liveability of medium density ‘small houses’: terraces, townhouses and the like. Our NEAT competition entry responded to fieldwork with compact housing occupants and their observations about privacy, flexibility, size, expansion space, garden space and many other aspects. Our ‘HI-lo’ precinct of houses is organised around shared edible gardens across two levels: at the ‘HI’ and the ‘lo’ level. Cars access the precinct but share space with pedestrian paths and private garden space. HI, lo and HI-lo houses are clustered in groups, offering many permutations for expansion and contraction of household occupant numbers, hobbies, home and work life over time. The ‘HI’ house features upper-level living, with loft above. The upper-level northern courtyard and surrounding communal landscape offers resident privacy from the street and a range of spaces to access. The house has two front doors, at ‘HI’ and ‘lo’ level, with floor layouts flexible for single-level living on each. Variations might include home office studio, tenant or carer at lower level with living above or vice versa. We focused on simple materials and standard construction techniques along with passive design features responding to the Canberra climate, with both the initial build cost and ongoing running costs kept affordable. The precinct is articulated using slender pitched roof forms. These offer screening between houses, while the forms limit overshadowing. The result is a medium density precinct, which allows for privacy and communal possibilities and with landscape weaved throughout. 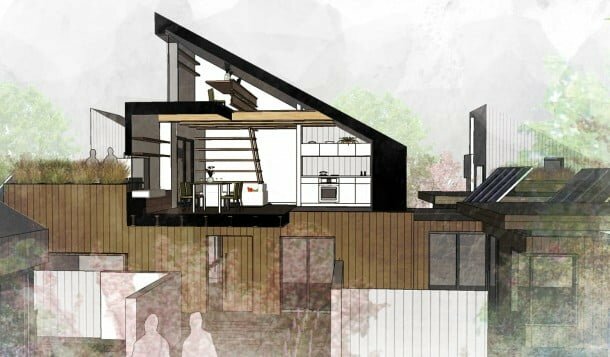 Several spin-off projects on compact housing are now underway in Canberra. NEAT competition, winning entry by Melinda Dodson, Tim Dyer, Candice Andrews and Phoebe Gordon. What is the biggest challenge you have faced as a woman in architecture and how did you overcome it? I don’t want to over-emphasise the challenge, but from time to time there is marginalisation, similar to what no doubt applies in other industries and professions where there is under-representation. For some in the construction industry, women in senior roles are still a novelty. It’s a form of underestimation from people who don’t know you well, but being underestimated means you can surprise people when you get the job done anyway. I’ve always used it to focus me on whatever the project outcome is that I am trying to achieve instead. Who do you look up to in the architecture profession? I have a long list of women and men that I could offer – I guess it’s all the people I feel I have learnt from over the years. Alastair Swayn sits at the top of that list for his architectural values, strategic outlook, and his passion for the city of Canberra, architecture and the profession, as well as for his generosity. What is a typical day at work involve for you? Running a busy architectural practice, finishing my PhD and finishing renovations! In the business that means dividing my time between business administration, interacting with clients and the MDa team, design and 3D modelling. My PhD occupies some evenings and weekends. What are you looking forward to in your career? Completing my PhD mid-2016 and building the practice further; anyone who runs a practice will tell you how engaging that is. It has an ‘otherness’ quality to it as well. I’ve found that in commercial practice you have to facilitate the progress and performance of the team in your practice with all that this entails. It’s a pleasant irony really that you may own the practice, but it’s not really about you. Rather, it’s how you facilitate the progress of others — an important daily endeavour. What do you see as your core strength in the practice of architecture? The integration of design and research into projects. But to be more precise, the quality of our design work is continually improving as we acquire more skills and techniques to investigate – really investigate – the needs and wants of the occupants of our built designs. I have always seen the ‘no bigger than necessary’ agenda as a form of sustainable architecture, but increasingly this approach also has the potential to minimise the resource wastage that stems from built solutions that are unsuitable for the occupants and/or are difficult to change. I suspect this is a controversial point of reflection for the profession, but the body of social research on occupant satisfaction with medium density ‘small housing’ of the last five decades justifies the sort of approach I am advocating. Research also challenges your preconceptions and this is essential to any creative endeavour. Melinda Dodson was interviewed by Michael Smith from Atelier Red+Black. This profile is co-published with the Australian Institute of Architects. Parlour Partners support our work as Corporate and Institutional Partners. Parlour Friends are the many practices and individuals who contribute through tax deductible donations or by supporting our crowdfunding campaigns. © 2019 Parlour. All Rights Reserved.